This 12 Volt 10Ah Deep Cycle is an excellent value. 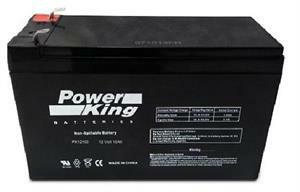 We send you (1) 12 volt 10ah battery. Deep cycle battery plates have thicker active plates, with higher-density active paste material and thicker separators. Alloys used for the plates in a deep cycle battery may contain more antimony than that of starting batteries. The thicker battery plates resist corrosion through extended charge and discharge cycles. 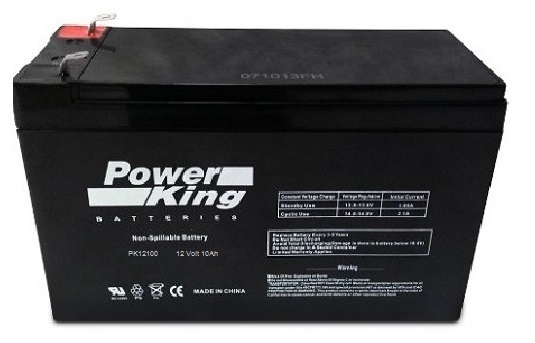 Power King Valve Regulated Lead Acid batteries are designed with AGM technology, high performance plates, and high performance electrolyte to gain extra power output for common power backup system applications widely used in the fields of UPS and Emergency Lighting. Features include sealed and maintenance free operation, non-spillable construction design, ABS containers and covers, safety valve installation, high quality and high reliability. Exceptional deep discharge recovery performance, low self-discharge characteristics, and flexibility in design for multiple install positions.